The government shutdown, which began on December 22, is now bumbling into its third week and its impacts continue to emerge across the United States. Government employees are going without pay, government contractors aren't eligible for back pay, national parks are dealing with unmanageable garbage and human waste, and Native American tribes have had essential basic services cut. Amid those more serious repercussions is one that may be felt by craft beer drinkers around the country. 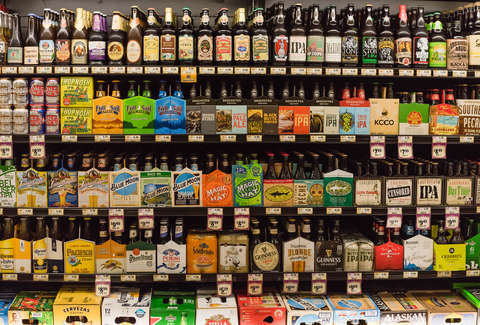 New beer releases could be delayed by the shutdown due to the shuttering of the Alcohol And Tobacco Tax And Trade Bureau (TTB). The TTB is responsible for reviewing and approving new beer and wine labels for sale across state lines. As of the shutdown, the agency's website redirects to a message that begins, "Due to the lapse in government funding, only websites supporting excepted functions will be updated unless otherwise funded." It importantly notes that "submissions will not be reviewed or approved until appropriations are enacted." "TTB has directed employees NOT to report to work and they are prohibited by federal law from volunteering their services during a lapse in appropriations," the agency said. Companies who have submitted new beer labels will have to wait until the office reopens to get approval. As the shutdown continues, it's expected the mounting backup will only continue to grow. (Don't forget that President Trump has threatened the shutdown could last for "months or even years," however unlikely the latter may be.) Though, representatives from the TTB are not available for comment, because, you know, see above. The Brewers Association, a trade association representing craft breweries, told its members, "Breweries should be prepared for the labeling and permit process to take longer than previously estimated. Also, be aware that when the government is funded again there could be a backlog. Breweries should plan accordingly." The BA also warned that breweries that have applied for loans for new spaces may experience delays because banks and credit unions "are likely unable to get the information they need from the federal government to process your loan." Some breweries have voiced displeasure on Twitter. "There isn't really anything worse than having your business interrupted by things you cannot control, and this government shutdown is turning into a full pint of problems for us," Tom Whisenand, co-founder of Minnesota's Indeed Brewing, told Thrillist. "Right now we are facing delays in the federal licensing of our upcoming Milwaukee brewery and taproom and delays in the approval of newly designed beer labels." While some breweries like Prairie Artisan Ales and Indeed say they've already felt the repercussions, multiple breweries Thrillist spoke with said they have not yet been impacted because their schedule is such that labels for the immediate future were submitted to the TTB long ago. "If it lasts a while," Joshua Stylman of Threes Brewing said, "it could impact our production schedule." Fair State Brewing Cooperative president and CEO Evan Sallee echoed that sentiment. "Right now we’re okay, but certainly if this drags on for an extremely long time it could be very problematic for us," he said. "But at the end of the day, there are many other people and businesses being much more substantially harmed by the unnecessary Trump shutdown than us." While the ramifications for consumers might be a ways off, if they're truly felt in any significant manner, it's clear that the shutdown is already being felt across the industry. It not only impacts breweries and drinkers, but bars, resellers, and distributors as well, showing how the shutdown touches far more than the 800,000 affected federal workers. Stephen Colbert channeled the old Stephen Colbert on Tuesday's The Late Show, breaking down the shutdown in terms of its beer problems. Dustin Nelson is a News Writer with Thrillist. He is someone's brother-in-law and he has made his brother-in-law drink his homebrew. Sorry. Follow him @dlukenelson.